Willie’s Paving is a local paving contractor serving Central PA including Mechanicsburg PA, Harrisburg PA, Carlisle PA. York PA, Hallam PA, and Wrightsville PA. We’re the area’s only PennDOT certified paving contractor. Contact us today for help on your next project. 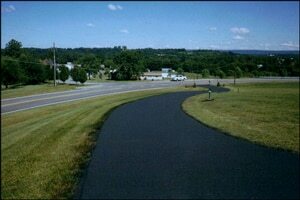 Installation of new asphalt paving and the repair of damaged asphalt pavement is what we do most often. For an asphalt paving job to be done right, you need to have the right equipment, proper materials, and people who know how to use them. At Willie’s Paving, we believe no one does it better. Our grading crews can prepare your job site for balancing the subgrade to installation and finish grading the aggregate base. This is essential for the proper results and long life of your asphalt pavement. Our main line paving crew handles jobs from small parking lots with light traffic to heavy duty areas such as truck terminals. Let our helpful staff design and provide the right results for your exact paving needs in Central Pennsylvania including Mechanicsburg, York, and Harrisburg PA.